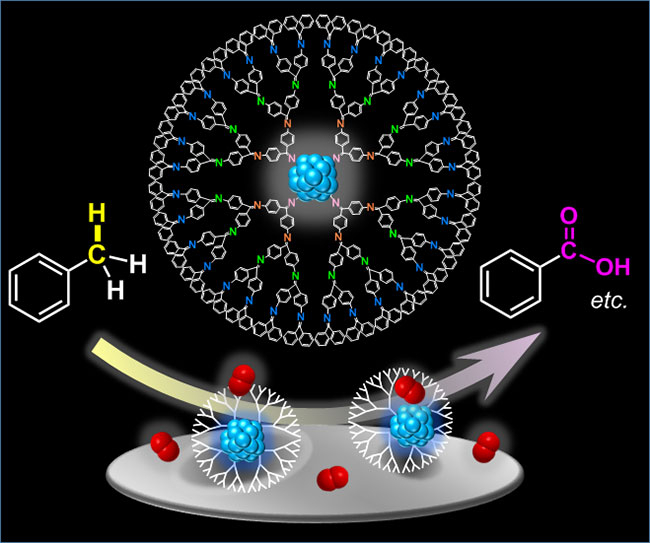 Scientists at Tokyo Institute of Technology produced subnano-sized metallic particles that are very effective as catalysts for the oxidation of hydrocarbons. These catalysts can be as much as 50 times more effective than well-known Au-Pd bimetallic nanocatalysts. Figure 1. Catalytic activity of subnano-sized metallic particles within dendrimers. Each dendrimer molecule hosts a subnano-sized metallic particle that allows for the oxidation of aromatic hydrocarbons, such as toluene (left), to produce useful organic compounds, such as benzoic acid (right). Oxygen molecules are represented in red. Berkah Jumat Alhamdulillah Paper kami diberitakan di halaman utama website kampus dan dimuat diberbagai berita IPTEK international. Posted in Aktifitas, Pendidikan, sci & tech and tagged Catalyst, Chemistry, dendrimer, Free-solvent, Green, Hydrocarbon, Katalis, Oxygen, subnanocatalysis, Subnanocatalyst, Subnanometer, Subnanometer particle, Toluene, Yamamoto on 17 November 2018 by stunecity.